inLogic delivers RFID asset tracking software for organizations looking to streamline their asset tracking process. We provide turnkey solutions including software, readers, tags and implementation services. 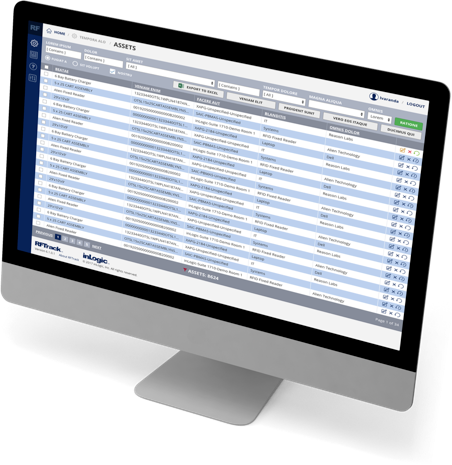 Whether you want to automate your annual fixed asset inventory audit or provide real-time visibility of your assets, our software can handle your business needs. inLogic is a U.S.-owned company founded in 2001 with a focus on developing data collection solutions. Our focus transitioned to RFID in 2004 as the technology began to gain traction in the market, and our first RFID-based product was released in 2005. The RFID expertise gained over the years has enabled us to improve our services, refine our software, be innovative, and stay at the forefront of our customers asset tracking needs. Our RFTrack software platform helps Education, Government, Defense, Aerospace, Research, Manufacturing, and other organizations save time, reduce operating costs, and improve fixed asset visibility. Our commercial off-the-shelf (COTS) software platform significantly reduces the man-power required to physically track assets by automating fixed asset inventory audits, locating missing assets, improving asset utilization, and tracking the movement of assets to improve visibility. © 2019 inLogic, Inc., About inLogic.